June 2015 – Arkansas Glasshoppers, Inc., Welcomes You! The members in the Arkansas Glasshoppers know it is hard to pick just one favorite piece or collection of glass, so we all have many! Our monthly meetings give us the opportunity to learn about glass, ask about glass we have, or share our favorites with members and guests over dinner. It’s a fellowship of glass enthusiast every month! 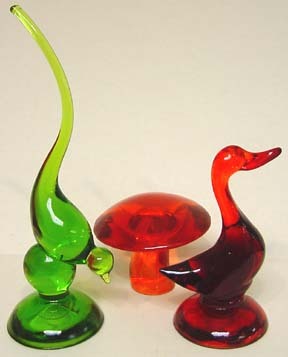 Some of my favorites are the Viking birds and other Viking glass sculptures. They look so elegant! I have a collection on my kitchen windowsill above the sink. The light really makes them come alive! The picture below is from a dealer’s booth at the 2015 Arkansas Glasshoppers Glass Show & Sale.